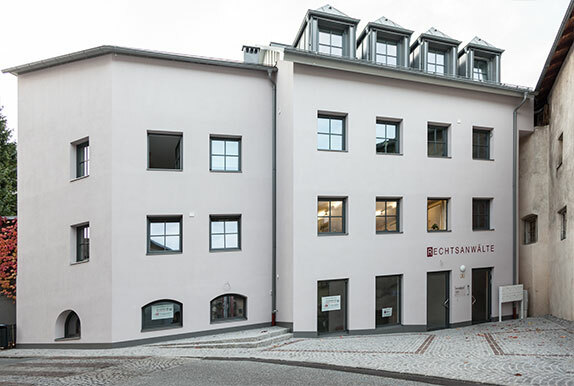 Our lawfirm having been newly built and re-opened in 2013 is located in the city center of Schwaz, Tirol. Having been Austria’s second largest city and a stronghold of mining, Schwaz was called “mother of all mines” in the Middle Ages. For centuries, the city has been a traffic and trade hub in the heart of Austria and Europe. This is demonstrated by many sights like the gothic church, the cloister of the Franciscans or the historic district. However, Schwaz is also a venue for reputable cultural events such as the Klangspuren Festival or the Outreach Jazz Festival. Take the motorway exit Schwaz and the first exit at the roundabout, after the second crossroad with traffic lights (Ärztehaus Schwaz) turn left and cross the city square into Burggasse, our lawfirm is located after 250 meters right from the Marienapotheke (red labelling “Rechtsanwälte”). Coming from the West after the place-name sign “Schwaz” at the first crossroad with traffic lights (Ärztehaus Schwaz), turn right and cross the city square into Burggasse, our lawfirm is located after 250 meters right from the Marienapotheke (red labelling “Rechtsanwälte”). Coming from the East, after the place-name sign “Schwaz” at the second crossroad with traffic lights (Ärztehaus Schwaz), turn left and cross the city square into Burggasse, our lawfirm is located after 250 meters right from the Marienapotheke (red labelling “Rechtsanwälte”). You may either park free-of-charge directly in front of our lawfirm or on the parking of Raiffeisen Regionalbank Schwaz close to our lawfirm (fee depending on parking time). You are getting to the parking space of Raiffeisen Regionalbank Schwaz if turning right immediately after having passed Marienapotheke.